I may have mentioned that Domaphile is on a gluten-free diet these days after learning of a potential sensitivity to gluten, that essential protein in wheat that gives elasticity to dough and structure to baked goods…and a whole world of trouble to people who can’t easily digest it. I’ve known for a while how dicey gluten can be — I have lots of friends or children of friends who either have a gluten allergy or full-on celiac disease. But about six months ago, when I began to consider the possibility that I might share their affliction, it was as if every other news story or magazine article I came across was about gluten allergies, how common and pervasive they were. Funny how that happens. Unless you suffer from celiac or react dramatically to even traces of gluten, following a gluten-free diet is not overly challenging. And some of the challenges — like getting creative about substitutions — can be downright fun. Some things, though, are tough to replace — much as I like the buckwheat buttermilk pancake recipe we found at Food.com, I still long for the fluffy wheat-flour ones we used to make. And I’m still ambivalent about kasha. I’ve drawn most of my recent inspiration from the Gluten-Free Girl. Her blog is excellent, and her cookbooks are mouthwatering – you won’t notice what they are missing. I recently took a day-long gluten-free baking class at The Natural Gourmet Institute, which focused on using flours made from alternate grains, pulses and starches. It was lots of fun and something I’ll report on in a future post. 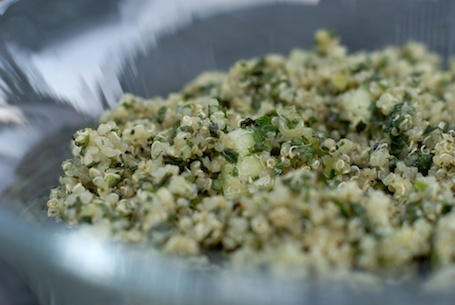 But my favorite gluten-free concoction we’ve made recently is a simple adaptation with a single substitution: tabbouleh, the classic Middle Eastern grain salad, with quinoa instead of bulgur. Quinoa has a similar earthiness and chewy texture, and if you like it already in its own right, you won’t miss the cracked wheat! Unlike the Lebanese version of tabbouleh, which is heavy on the parsley and lemon juice, this one has more grain than herb and isn’t overly acidic. The lemon zest brightens things up and plays well off the mint. Enjoy as a mezze salad, with hummus, labneh, babaganouj, and roasted red peppers, or alongside grilled fish or chicken. Hold the pita. Rinse quinoa, combine in a saucepan with 2 cups of water and a ½ teaspoon of salt, and bring to a boil. Reduce to a simmer, cover, and cook for 15 minutes until the water is gone and the quinoa is fluffy and chewy. Transfer quinoa to a mixing bowl and allow to cool to room temperature. When cool, toss in the minced scallions, mint, and parsley, and diced cucumber. Add the olive oil and mix to coat the grain, vegetables, and herbs evenly. Add the zest and lemon juice to taste, depending on how acidic you like it. Season with salt and lots of fresh ground pepper. This entry was posted on July 27, 2011, 7:26 am and is filed under Gluten Free, Recipe. You can follow any responses to this entry through RSS 2.0. You can leave a response, or trackback from your own site. Yum! This is how we make it too! I like it so much better than with the bulgar. We too are trying to cut our wheat consumption. It is really amazing how many resources there are. I can not imagine trying to do this even 5 or 10 years ago. I like that. I’m going to try that hummus & tabboueleh without a pita combination right after I dip into some cream cheese without a bagel. Wait till you try one of my gluten-free bagels, Ari…. Ari, I respectfully take issue with your premise (as well as your regrettably snarky tone). Hummus and tabbouleh are not condiments–mere schmears, if you will–like cream cheese. They need not be eaten only with pita. Cucumber rounds work well, as do a variety of gluten-free crisps and snack chips. Indeed, they even may be eaten with a fork…assuming you know what that is. Is smoked salmon a condiment? I’ve never seen anyone eat it without accompaniment. Do people put smoked salmon on cucumbers? Sure. Is a cucumber-salmon combo as tasty as smoked salmon on a bagel or sliced pumpernickel? Perhaps it is for some people. Mostly Buckeyes. This is exciting. In the old days of eating gluten and suffering regular abdominal pain, I would eat tabbouleh almost every day. It’s been a long time. Then you will love this! It’s delish. ahhh i love quinoa! yay for gluten free living :). i’ve been eating millet lately, which is pretty similar to quinoa.